Sonya Kanady, 53, wishes that somehow, she could repay her doctor, Brandon Abbott, DO for saving her life. As a patient of Dr. Abbott for a year and a half, Sonya’s health and wellbeing have taken a complete 360 since she first saw Dr. Abbott. Sonya has type 2 diabetes. 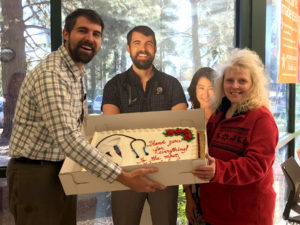 It was a visit to the emergency room at Flagstaff Medical Center that woke Sonya up to the reality that if she didn’t make significant lifestyle changes, her future didn’t look bright. In the fall of 2015, Sonya’s health started to decline. She felt that something “wasn’t right;” she was seeing double and felt lightheaded. She kept calling in sick at work. When she took herself to the emergency room, she discovered her blood glucose level was near 700 mg/dl. A normal blood glucose level for someone without diabetes is less than 140 mg/dl. Sonya needed to start seeing a primary care provider and get her diabetes under control. The only problem was that she had been without health insurance for the last 10 years. She couldn’t afford her employer’s health insurance, and she earned too much to qualify for AHCCCS, Arizona’s Medicaid program. Sick and out of options, Sonya decided to quit her job in order to qualify for AHCCCS and make her health her number one priority. Within days Sonya was approved for AHCCCS, and she began seeing Dr. Abbott regularly, every two weeks at first. It wasn’t long before Sonya and Dr. Abbott realized that her road to better health would come with speedbumps. Sonya had an allergic reaction to insulin, so Dr. Abbott then prescribed synthetic insulin to keep her blood sugars at a normal level. Then when that medication caused infections, Dr. Abbott found another medication that worked better for Sonya. He prescribed metformin and blood pressure medication that helped keep Sonya alive. Through Dr. Abbott’s care and problem-solving, Sonya’s blood sugar is now in the normal range. Not only did Dr. Abbott get Sonya’s diabetes under control, but he also made sure she completed all recommended preventive screenings, based on her age and condition. Now with health insurance, Sonya completed a diabetic eye exam, well woman exam, mammogram, colonoscopy and blood tests. All her results came back clear. Sonya could rest assured, knowing she was healthy and her diabetes was under control. Sonya attended North Country’s diabetes education classes and support group on evenings and Saturdays. Her success motivated her to attend the classes; it was her hope that she could inspire others with diabetes who were struggling to get healthy and stay healthy. To help us keep patients like Sonya healthy do to the things she loves to do, we need your support. Make a donation to North Country HealthCare’s foundation today.